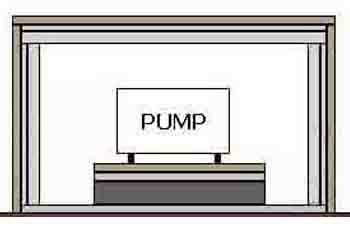 Pumps are often noisy because they are sitting directly on a lightweight base with no anti-vibration insulation between. Installation of our Acoustic Enclosure Kits is the answer to this problem. They include an anti-vibration mat between the bottom of the pump and the base on which it sits and this will absorb much of the vibration based noise often experienced. This can be further enhanced if a patio slab is placed on top of the anti-vibration mat, another layer of anti-vibration mat glued to the slab with the pump attached to a layer of MDF or ply which in turn is glued to the anti-vibration mat. Particularly effective when applied to domestic shower pumps. Airborne noise may also be a factor and for this it is recommended the pump is enclosed within a sound insulated box. 12mm MDFor thicker is good for this and can be lined on the inside with soundproofing foam SA25FF/B/6 Sound absorbing foam and noise barrier laminate. (See illustration below) This insulation is nominally 32mm thick so the box will have to be of a suitable size to accommodate this. A larger enclosure will give more effective noise reduction. CROSS SECTION OF SOUNDPROOFED PUMP. If the box requires ventilation we would advise designing an acoustic baffle in a similar way to the drawing on the left. Go to more information regarding the products mentioned in this article by clicking on the name of the product or item in the text above. There are further links to prices on the right hand side of each product page or simply click on the prices link below. More information on the soundproofing products for our Acoustic Enclosure Kits mentioned above can be viewed on this web site by clicking on the underlined product hyperlinks or by calling us on the number at the top left hand corner of this page.